I’m pretty pleased to be able to show a large range of work in this great heritage building and invite you to come along and see what I’m creating at present. 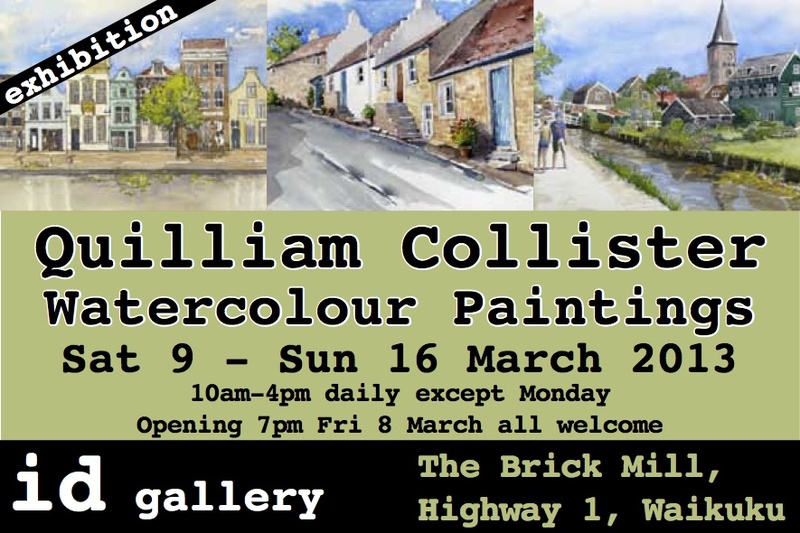 I’ll be painting in the gallery each weekend and at times during the week and would love to have a chat with anyone who is interested in my work. Most of my paintings are from the last year and a number feature scenes from the cycle tour I made around Holland last year. You can read about the trip stepping forward (to the next post) starting from this link. The Brick Mill is becoming a great stop on the way north from Christchurch or a pleasant afternoon destination. There is a good cafe with indoor and outdoor seating, “Twine” a large antique shop with a range of fascinating stuff, a pottery and gift shop and a company selling classic and vintage cars. For sale will be around 30 paintings and pen and watercolour works. Most will be framed and ready for hanging, the rest will be matted, backed with foam board and in crystal clear resealable bags. Prices will range from less than $100 upwards. Here are some of the works which will be displayed.